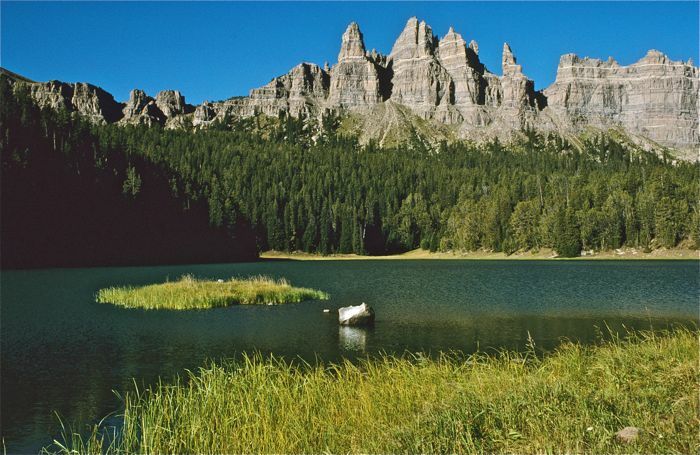 Northeast of Jackson Hole and adjacent to Yellowstone National Park is the huge Washakie Wilderness in the Shoshone National Forest, with towering volcanic mountains topped by rolling expanses of alpine tundra and rugged peaks. 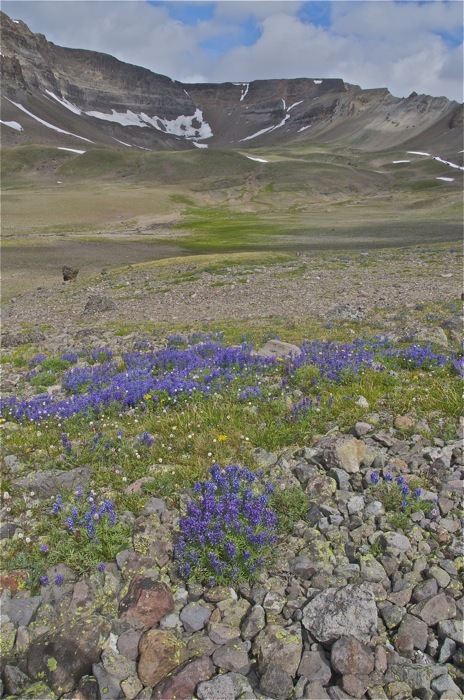 There are thick forests, waterfalls, lakes, deep canyons, and huge meadows punctuated by colorful blooms of summer wildflowers. Wildlife is abundant and includes nearly all species indigenous to the Greater Yellowstone region, including elk, bighorn, moose, wolf, and bear (black and grizzly). Elk will be bugling. The scenery is awesome and unusual. This is a fairly strenuous high altitude trek in one of the largest wild areas in the lower 48 states. It is a real alpine adventure with portions of the route off-trail and above tree line. It is pronounced Ab-sor’-kas. Trip base: Jackson, Wyoming. All of our routes are within the southern portion of the Wyoming Absarokas (this expansive range runs north all the way to near Livingston, Montana), north of Dubois, Wyoming. Depending upon various factors we’ll either do a loop trek in the DuNoir Creek and Buttes/Kissinger Lakes area, the Wiggins Fork/Emerald Creek country or the fabulous Five Pockets area. All of these areas are amazing, a bit of Alaska in Wyoming! TREK BASE: Jackson, Wyoming. Antler Motel, 43 West Pearl Street, Jackson, Wyoming; 800-522-2406 or 307-733-2535. MEETING TIME: Pre-trip orientation including food and gear handout plus safety talk at 6 pm the evening prior to the first day of the trip. TRANSPORTATION: Major air service to Jackson, ground transport to motel available upon arrival. Alternatives: fly to Salt Lake, Bozeman MT or Idaho Falls ID and rent car. For bus service to/from Idaho Falls or Salt Lake call 800-443-6133 or 307-733-1719 (Jackson Hole Express). Please make air reservations to Jackson promptly, as flights tend to fill quickly. TREK RATING: This high altitude trek near Yellowstone is fairly strenuous. Much of the route is off-trail near and above tree line. We’ll cover 5-10 miles/day with one or two layovers, and there will be a few steep high altitude stretches, so good cardio-vascular conditioning is essential! Total miles (not including day hikes): about 30-35. ELEVATIONS: 8,000 to 11,000 feet with optional day hikes to higher summits. Maximum one-day elevation gain with backpack is 2,000 to 2,500 feet, depending upon our exact route. WEATHER: Above and near tree line it can be very cold and windy. Typical weather includes warm afternoons with scattered thunderstorms and nippy, sometimes frosty nights. In the high country anything can happen, so we must be prepared. All-day summer rains are unusual. Click here for the National Weather Service forecast. SPECIAL FEATURES: This is one of the great high alpine landscapes anywhere in the U.S., with one of the broadest expanses of alpine tundra in the country! Our route also includes craggy peaks, verdant woods and meadows, and lots of big vistas of high remote wilderness. Elk, bighorn sheep, moose, wolves, grizzlies and other wildlife abounds. Utterly spectacular! SPECIAL TIPS: Be in top shape and travel light (eliminate non-essential items). This is grizzly country, so leave all deodorants and other sweet smelly things behind. Due to the altitude, we recommend that, if possible, you arrive in Jackson an extra day early to acclimate (optional). 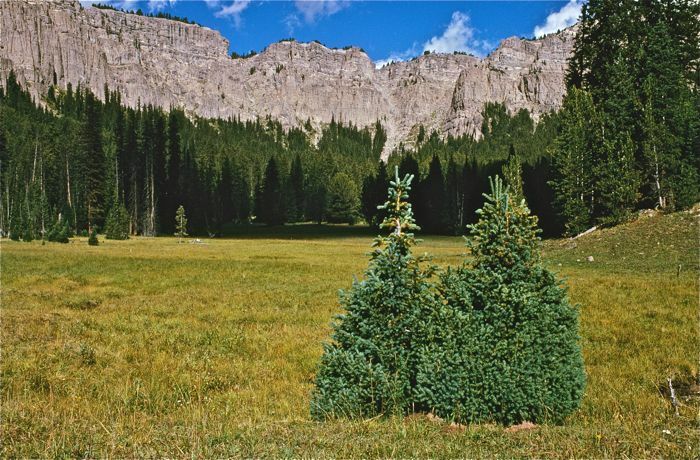 STATUS: The Washakie Wilderness Area is protected; the adjacent DuNoir area is proposed Wilderness. ITINERARY: We have 3 different routes, which vary from 1.5 to 3 hours driving time from Jackson. All routes are loops, and we’ll have one or two layovers. Please Note: Because we vary the route as conditions dictate, mileages and elevations are approximate, subject to change based upon weather and other natural variables. 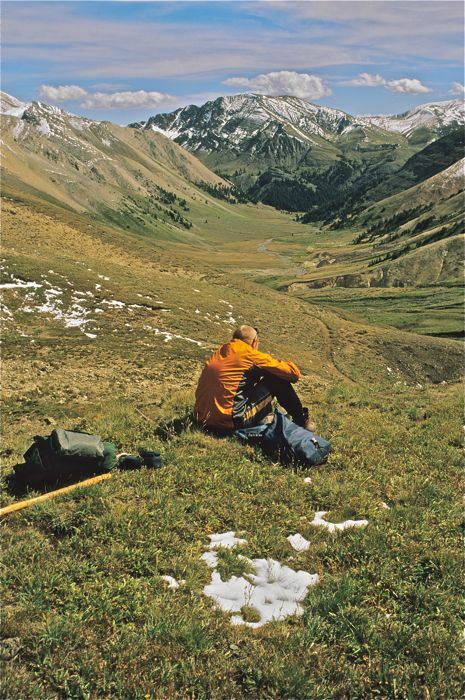 At the bold link below, we’ve listed our Wyoming backpacking / hiking trips. 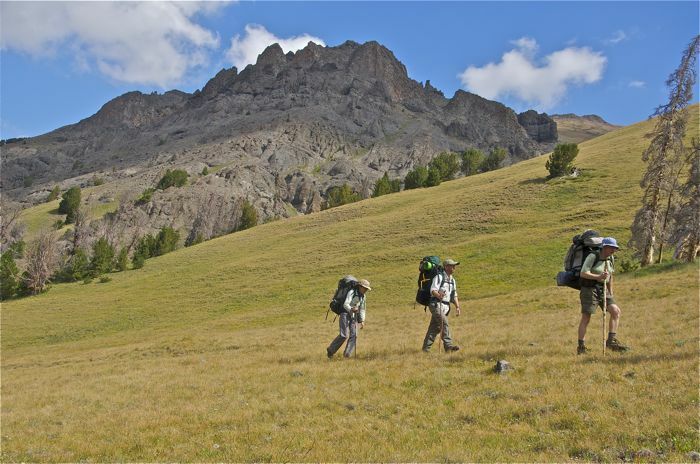 Read about our backpacking treks, which are either in Wyoming, Montana or both states.